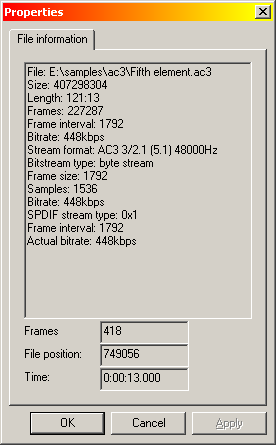 AC3File is a DirectShow source filter. It is required to read any kind of AC3 or DTS files. AC3File is a DirectShow source filter. It is required to read any kind of AC3 or DTS files. There are many kinds of AC3 and DTS files. Some files are ripped from AC3/AudioCD or DTS/AudioCD, some files are ripped from DVD in PES container some files may have different byte order. All of these files are supported by AC3File. From the makers of AC3Filter.